It’s another A/B feature, being trialed only for the blind in Venice. your comment actually helped me get it. I don't think they were really that emphatic in saying no in the past. They just said it didn't make sense given the current userbase and the current resources available. Maybe some mobile developer resources got freed up, or someone on staff just finished learning how to develop for windows phone, or they felt the stats on what's being used and where had shifted enough to make it worthwhile, or maybe they even got some kind of special help and/or compensation from the Windows phone team to encourage the development of the app. There are lots of things that could have changed to make their perception of the right decision change. The deciding factor seems to be the fact that WP is 2nd in market share in Brazil (behind Android), which is home to Duolingo's 2nd largest user population (behind the USA). It's also very popular in many other developing countries because it's not particularly popular in the more developed nations. Consequently, a lot of those devices get dumped cheaply into developing markets. That's a lot of potential users to reach, so it's now worth it for them to do it while it didn't make as much sense just a year ago. The relatively small group of WP users in developed nations are the lucky benefactors of this move. I think rather than phone dumping it is a question of where the untapped markets are -- it makes sense to make and sell cheap phones where the market isn't saturated yet, rather than focus on competing in markets where the saturation is already more than 100% (as it apparently is here in the Nordics -- we have on average more than one cell phone per person). Yes, Luis has explicitly stated that this is the motivation. @pont - yes, his re/code appearance is where I got my information. The further explanations given about the percentages of users of different kinds of phones and so on came from other users here on the discussion board, not from Duolingo itself. So they have clearly changed their minds -- be it due to further resources or whatever. I'm happy that they have. Actually, the reasons I stated (Brazilian & other developing markets) came from Luis at a recent appearance in NYC (video here relevant bits @ ~21:00). @pinkodoug: I was referring to whether or not they were clear about having no plans for a Windows app in the past (not the reasons why they have now changed their minds). They were certainly clear about this before here on the discussion board. For some reason I can't open that video on my computer. @annika_a I see what you mean now. I misinterpreted what you were saying. What are the nonsense characters on the bottom of your comment? His username converted into Base64 encoding to make it easier to find his own comments using search tools, if I recall correctly what I saw in one of the other threads. A way to represent binary data as a text string. For technical details, a simple search for "Base64" should provide ample information. The xp bar coming back for everyone? I wish. I also LOVED challenging other users. ;( wish we could still have fun with that. But only for your bear. That is so awesome! Took me a couple minutes to figure it out. Haha, wait, silly me, you need to be holding down spacebar when you click. That's really cool. It was a joke. Well, I'm pretty sure. Does it give a clue to what's coming? EDIT: Finally got it! So I'm just assuming that they're half a dozen trolls working together to trick us. Like with the 'hold spacebar' thing. That would make the browser scroll down, and how no one actually revealed how to do it. I think this is the answer..
Nobody can actual tell how to do it so I say it's fake. Someone prove me wrong. Simple. Hold down spacebar and click. That's not working for me, but I have a Mac. Maybe it only works in Windows? Is this like "How to keep a turkey in suspense?" That's the first thing I though when I read that, you gotta admit it's pretty clever. > you gotta admit it's pretty clever. Yes, and Germans have a reputation for being rather humorless. Stealth humor, it seems. . . . And maybe a fake "Easter egg" could be called a "turkey egg"? I may just start using that term but then again I don't think I may get many chances to use it. Sorry, that would spoil the fun. If you get it, you get it. Does it work on a tablet?? Does it help if I rap my screen with my wand? Or does it have to be the mouse? I hate these lame teasers. I think it is safe to say that it is highly unlikely that feature will come out this year. Perhaps next year. That was the first thing I thought when I saw this discussion. :D I don't know, but I'm excited. Please, Windows Phone app!! I've been waiting for ever! Probably a Windows Phone App. That's nice I guess but I would prefer that either the Maltese or Finnish course applicants get their applications approved. I want the Amharic applicants to get their applications approved! WOOOW finally!!! The main reason i bought a smartphone was to use Duolingo, imagine my disappointment when i found out that there isn't infect an app for Windows Phone.. So thank you so much for doing it, i'm waiting for over a year for the app to come. You definitely made my day! Awesome! 1 week and 5 days till November 19th! Is that when it releases? I have a friend whose birthday is Nov. 17th. He's super excited! AHHHHH, La ventana no es abierto!!!!!! La ventana no está abierta. an all-audio app, with decent voices and awesome voice recognition would actually be a very pleasant surprise. Wow! I'm going to get a proper usage of my phone now. Super thrilled. Losing Duo was such a downer when I switched to my Windows phone. So glad I'm getting it back! i just dont get it, whats happening with this? Probably Windows Phone app... that's why the window! It's the Duolingo App for Windows PC. Wow. This got a TON of comments!!! maybe for the blind? and a windows phone?? It is also my birthday too. So so, today is the day. I'm hardly wating for that! It isn't in my WP Store yet. Is it coming today really? Thanks d.floresumana ! I had to do an atualization in my phone to get it. You helped so much sending me the link! And thanks for Duolingo developers. This is really important to depelopers countries, where I live and where the WP market is huge! when will you update this? It says me I skipped learning when I learn on PC! it doesn't allow me to make more two errors when practicing! Guess who Duolingo met at the White House Yesterday? Brace yourselves, Arabic is coming. Hawaiian is coming to Duolingo! 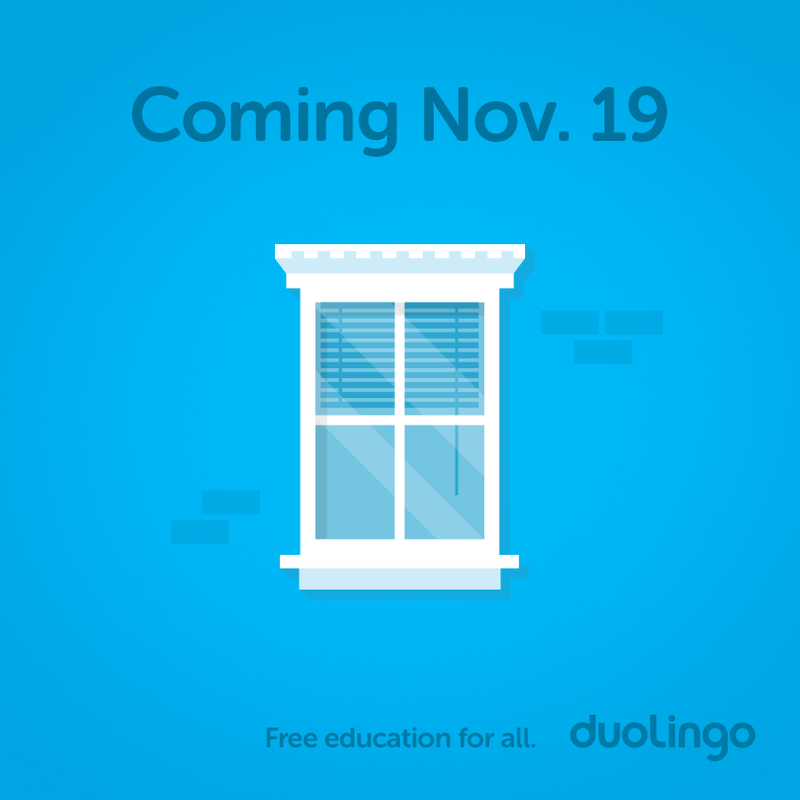 Duolingo Plus coming to Web!